Ok, so I have another theory. 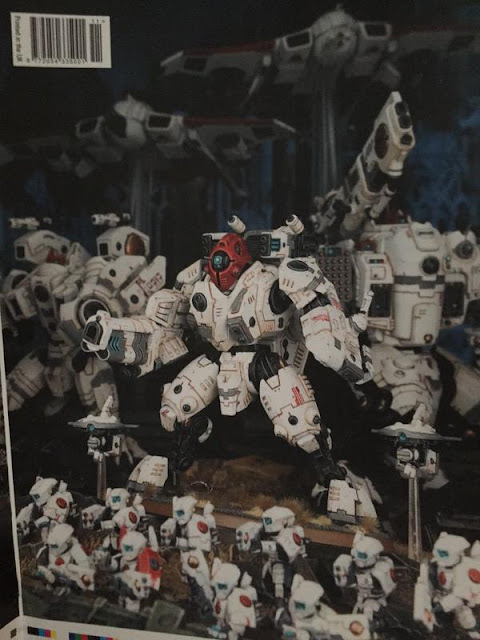 The new fire warriors just might be veterans. In the previous codex, Ethereals were permitted to have an "honor guard." This was squad of veteran fire warriors which cost two points more per warrior, but had a +1 to their ballistic skill. What if the new warriors pictured are vets? Pulse rifles with markerlights? No, they would never do that, a little OP. A squad weapon that doesn't require a fireblade? I think is a new unit with a diferent type of weapon, the design is similar to the alternative giant gun of the stormsurge. Maybe is another troops choice or elite...or cg guard of a ethereal or fireblade. I am quite happy with the new changes for all Tau units. Me personally still like the older Crisis Battlesuits and will still field a team of them. Anyways on to Fire Warriors. These guys, along with the Hammerhead won me over and made me stick with Tau Empire. However, I do love the new units and think they will be a good face lift for them. I do think they need a little boost, but if you play them right the Fire Warriors are deadly just the way they are. I'm looking forward to see what they are planning for the Tau Empire and will welcome it all with open arms.